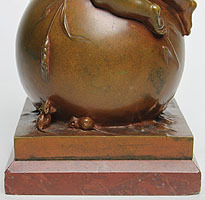 Louis Kley (French, 1833-1911) A Fine and Charming Patinated Bronze Group of a Young Boy Climbing on a Vase Fearful of Two Mice. 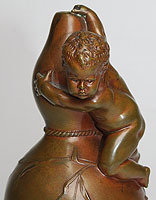 The finely executed bronze group depicting an naked infant boy atop of a bottle-shaped vase scared of two mischievous mice at the base trying to get to him. 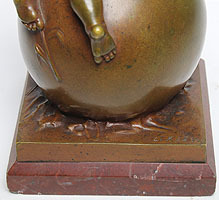 Raised on a square Royal Red marble base. Signed at the base: L. Kley. Circa: 1880-1890. Louis Kley (French, 1833-1911) was a sculptor born in Sens (Yonne) on March 17, 1833 and died in Celle Ville, France on March 8, 1911. He exhibited at the Salon in Paris in 1853 and won a medal at the Barbedienne competition.He also exhibited and won a silver medal at L' Exposition Universalle of 1889 and other awards at different exhibits in Paris. Kley's Works at Museums Le Museé de Sens, France - "Allegorie" - "Les Vestales" - "Brennus" Museé des Castres, France - 'Bust of Cardinal Bernardon" Literature: E. Benezit Dictionaire des Peintres, Sculpteurs, Dessinateurs et Graveurs by Gründ - Nouvelle Edition, 1976 - Volume 6, Page 242. 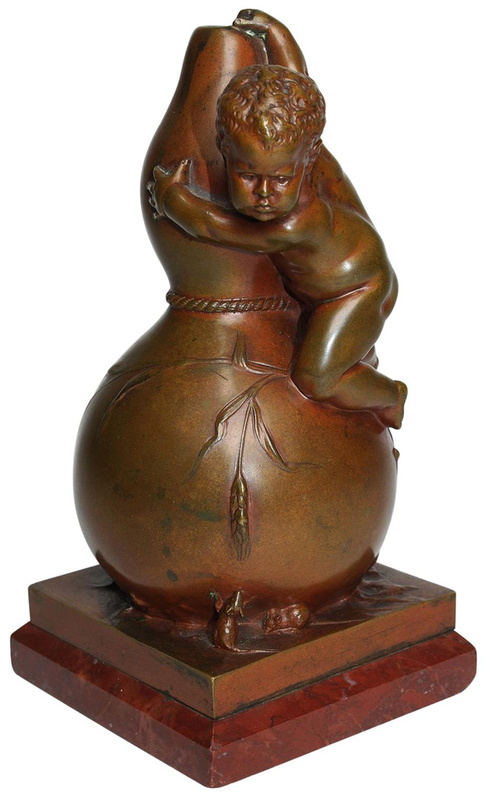 Louis Kley (French, 1833-1911) A Fine and Charming Patinated Bronze Group of a Young Boy Climbing on a Vase Fearful of Two Mice. 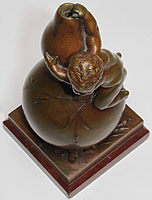 The finely executed bronze group depicting an naked infant boy atop of a bottle-shaped vase scared of two mischievous mice at the base trying to get to him. 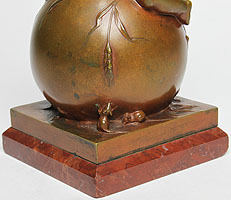 Raised on a square Royal Red marble base. Signed at the base: L. Kley. Circa: 1880-1890. Louis Kley (French, 1833-1911) was a sculptor born in Sens (Yonne) on March 17, 1833 and died in Celle Ville, France on March 8, 1911. He exhibited at the Salon in Paris in 1853 and won a medal at the Barbedienne competition.He also exhibited and won a silver medal at L' Exposition Universalle of 1889 and other awards at different exhibits in Paris. 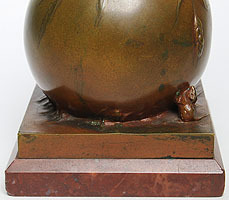 Le Museé de Sens, France - "Allegorie" - "Les Vestales" - "Brennus"
Museé des Castres, France - 'Bust of Cardinal Bernardon"
E. Benezit Dictionaire des Peintres, Sculpteurs, Dessinateurs et Graveurs by Gründ - Nouvelle Edition, 1976 - Volume 6, Page 242.